PHOENIX – As schools begin implementing Arizona’s Common Core Standards, a set of nationally developed principles guiding math and language arts education, state leaders unveiled a website Wednesday to teach educators and the community about the new guidelines. Arizona adopted the Common Core Standards in 2010. Schools across the states are beginning to implement them, as the standards must be fully in place by the 2013-2014 school year. “Arizona Common Core Standards not only improve what students learn, but how they learn, bringing teachers back to the fun and rewarding aspects of the profession they love,” Gov. Jan Brewer said. The Arizona Department of Education has trained more than 14,000 educators at over 400 training sessions, but there is still a long way to go to prepare Arizona’s approximately 70,000 teachers to make the changes. “As much training as the department has done so far, we’ve only scratched the surface,” said John Huppenthal, state superintendent of public instruction. According to Huppenthal, over 75 percent of districts and charter schools have sent staff to training sessions. The state’s model on preparing schools involves sending those staff back to train others. The department is also holding six webinars a month that are open to all teachers. Still, implementing the changes could be difficult for schools that already have stretched budgets. Higher standards and new practices, such as replacing the AIMS test with the PARCC test given by computer require new resources and training, and it is unclear where the funding will come from. “As Arizona has passed several reforms that have raised the bar, we do need to take a look at resources and how to make sure that those higher expectations are well supported,” said Pearl Chang Esau, president and CEO of Expect More Arizona, an education advocacy group. Huppenthal said that budget constraints won’t interfere with implementation of the new standards. State leaders say they are also leveraging partnerships with groups including Expect More Arizona, the Center for the Future of Arizona, Intel, Rodel Foundation of Arizona and the Greater Phoenix Economic Council. “In era of scarce resources, partnerships are absolutely critical,” Huppenthal said. Cronkite News reporter Caroline Porter visited a kindergarten classroom in the Balsz School District and talked about the new Common Core statewide standards. Gov. 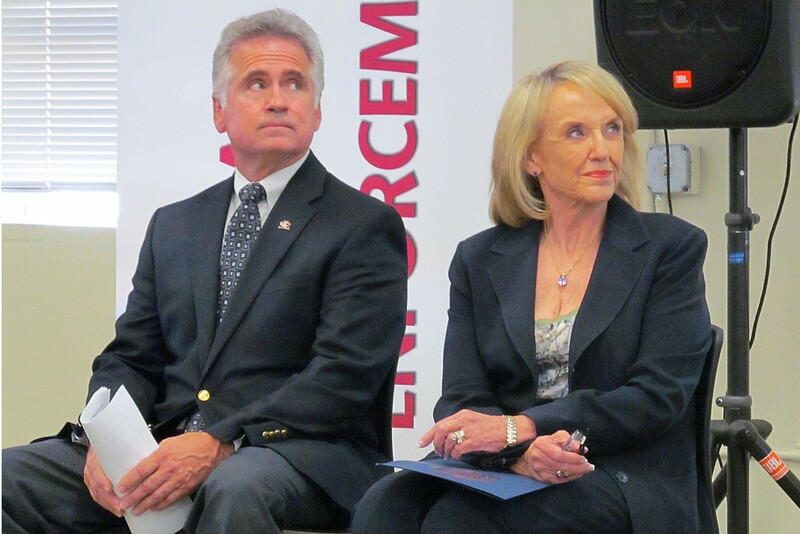 Jan Brewer and Superintendent of Public Instruction John Huppenthal listen to a speaker at a news conference on Wednesday, promoting new Common Core standards for math and English.